The most waifu fighting game on the planet has finally made its grand entrance on the Nintendo Switch. Dressed gloriously for the occasion, SNK Heroines: Tag Team Frenzy is ready to clash it out in an all-star food fight packed with Neo Geo’s fiercest femme fatales. This 2.5D team fighter certainly looks crazy enough to work, but does it come across with the charisma and intellectual depth of Rachel Riley, or will we be stuck with the shallow and vain emptiness of Kim Kardashian? 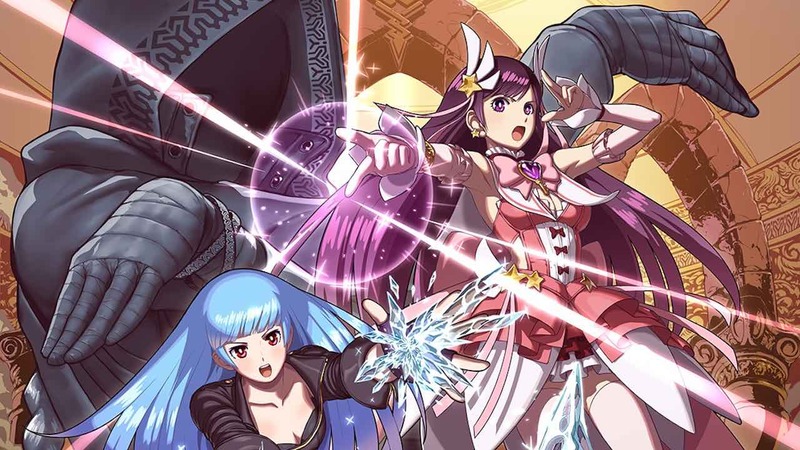 The first 30 minutes that I spent playing SNK Heroines: Tag Team Frenzy sent my mind racing to comparisons on how a team fighting game should be made. To my dismay, I realised there was no crouching, no quarter circle inputs for special moves and, worst of all, no assist attacks within the basic gameplay mechanics. Surely every team-based fighting game should at least have an assist attack now, shouldn’t they? Dragon Ball FighterZ has one, BlazBlue: Cross Tag Battle has one and professional wrestling pretty much invented the concept. So, why not here? Blasphemy, I tell thee! Besides morphing your partner on the spot to carry out a combo, your chosen characters in SNK Heroines: Tag Team Frenzy never appear on the same playing field together. Instead, your partner just dosses around in the background, twiddling her thumbs until she’s seamlessly tagged into the action. Yet SNK’s own 90’s classic, Kizuna Encounter: Super Tag Battle, did the same thing. Although, to its credit, it did race Capcom to the arcades to be one of the first tag team 2D competitive fighting games on the market. The point is, SNK has clearly been in the business long enough to know how fighting games work. That’s something that I was soon reminded about after an hour into the game when it eventually dawned upon me that this isn’t a conventional fighter that follows traditional rules. SNK Heroines: Tag Team Frenzy is its own beast of a brawler. One that looks incredibly simple and glamorous on the surface, but underneath its fickle shell and female Terry Bogard lies plenty of Sun Tzu strategy that will quickly divide the skill chart. This may sound a tall tale given the game’s style and easy approach structure. However, bang the CPU to level 5, and you will soon see a sample of the combo potential that will bleed into the veins of the better executioners in the community. In SNK Heroines: Tag Team Frenzy, the basic move list consists of Light, Heavy, Special and Throw attacks that grace the face buttons of your chosen control pad. The trigger and shoulder buttons are set up to allow you to swap out your character on the fly (ZR Button), defend yourself using a guard button (L Button) or let loose with a match-ending Dream Finish attack (R Button). Normal moves can have different effects depending on how far your character is from your opponent, while the most basic bread-and-butter combos are usually easy enough for anyone to pull off. Standard light attacks can work straight into heavies to cause a wall bounce for a handful of combatants. Spamming out three consecutive light attacks can be chained into more stylish special moves to end with a devastating Dream Finish. It’s simple stuff, yet there’s plenty of room for experimentation when mixed with air dashes and running wall bounce kicks. Special and Dream Finish are the only two attack buttons that you can use the directional input to change their properties. For example, down and Special may work as an anti-air attack while a neutral tap could fire a projectile. The Dream Finish is similar with a bigger bite at a pricier cost but opens up multiple combo-ending possibilities. There is a catch, of course, for both your Special and Dream Finish will chew through the meter which makes managing the glittery bar a strategic necessity. This is where the rather bizarre life gauge comes into play, and, in SNK Heroines: Tag Team Frenzy, meter is everything. Both teammates share the same bar of health but contain their own special rechargeable meter called a Spirit Gauge. If your vitality drops, your Spirit Gauge increases – supplying you with more room for possible comeback opportunities. Run low on this meter and your special moves are useless, forcing you to swap out in favour of your rested partner. Tagging during a classy combo can potentially extend the flow of the attack at the cost of your partner’s Spirit Gauge. On the other hand, an empty swap out will leave you mildly vulnerable. During the endgame, the core idea is that you must end your opponent with a Dream Finish when their life bar is flashing red. Landing this final attack can make for an incredibly tense situation given the right circumstance. The move can be blocked, evaded or even countered to keep the winning rival on the back foot. Waste your opportunity for a happy ending, and you could easily be kissing your victory goodbye. By completely draining your opponent’s health bar you will send your opponent into a temporary dizzy state for a chance of a free finish – assuming, of course, you have Spirit to spare or your opponent doesn’t have a final trick up their sleeve. The secret lies in items that are contained inside capsules. They float around the stage waiting for you to break them with the crossfire of a combo or an intentional poke to claim their prize. A quick flick of the Right Stick (or a swift shake with a single Joy-Con) will activate the item, usually to your own tactical advantage. They randomly come in the form of bombs, pans, character specific specials or even energy boosts to pull you out of the red. Your teammate will then launch the item from the background in an effort to be the closest thing to an assist attack you are going to find. They’re a nice touch to the gameplay – becoming especially handy during combos or as a last resort when stumbling about in a dizzy mess. In practice, everything gels together a lot easier than it sounds. Casual players amongst friends have a fun party brawler to buzz off, while the more seasoned player will quickly unravel the layers of the game’s innards. Despite combos lacking the technical inputs of, say, the Street Fighter series, SNK Heroines: Tag Team Frenzy’s more advanced combos still stay within the tradition of smacking hitboxes under strict timing and juggle opportunities. Where things do become particularly interesting is how the game then crosses the border between Japanese 2D arcade fighters and Nintendo’s own Super Smash Bros. series. The game’s flexible defensive options somewhat mimic that of the Nintendo brawler. Tilting the stick in combination with the block button gives you plenty of evasive tools, even when in the air. This makes up for the lack of overhead attacks as there is no crouching involved to stop players from turtling up. It also encourages a fast-paced element to the overall combat as well as a defensive tactic that can make landing a Dream Finish a dramatic event. It’s definitely a game-changing mechanic and one that’s certainly interesting to find in this type of game. The features that wrap around the combat are your typical bog-standard affair. The bizarre story mode doesn’t impose on the gameplay too much by staying brief with a slight variation in narrative towards each character. It’s more like an arcade mode with a touch of silly drama, which, to be quite honest, is pretty much how I like it. Other modes to sink your time into include your basic survival, training and VS mode, in which you can go at it two-vs-two for some fun four-player tag team action. The most advertised feature in the game is the customise option to give your main picks a unique touch with accessories and unlockable outfits. While some are quite revealing, the only creepy thing I really found about the game was the seedy churn of the announcer’s voice. He sounds more like he drives a fake taxi and seems far too old to be matching up young women. I did find that most matches are over far too quickly. A fight can feel more like a single round due to fighters having a shared life bar. The way the fights end is also a bit underwhelming in how the screen just fades out like an old song without conclusion. The biggest concern that I had was trying to pin down what crowd this game is actually aiming for. It may come across a bit too easy in execution for the high-level player while it’s overwhelming for the beginner when it comes to online play. The lack of combo trials may further discourage newbies seeking to learn. As for single player content, other than the simple story mode, there really aren’t enough features here to work with. Well, not unless you’re bang into dressing up anime girls or gambling on online matches. Before launch, servers for online were both barren and unresponsive at the time I wrote the review. As a result, I was unable to comment on the reliability of the netcode. Diving in a few days after release and things really haven’t gotten much better. It can take a very long time to get matched up with 80 percent of fights resulting in a laggy mess. The other 20 percent worked ok, but the frame rate seems to take a significant hit which is inexcusable for a game that clearly does not push the Nintendo Switch. Future software updates can possibly fix things, of course, but just be ready to keep these issues in mind when taking the plunge. However, the modes that accompany online do seem simple, yet decent enough for the most part. Rooms have a good amount of customisation, allowing you to shape preferences for your lobby. Room matches can be played two-versus-two with two bouts running simultaneously. Unfortunately, there doesn’t seem to be a clear ranked mode set in place, although, the noughts and crosses display of your recent progress is a nice touch. Game Battle was the most interesting mode that I came across, which gives you the ability to bet on yourself in money matches with in-game currency to unlock cosmetic goodies. It’s a cool addition that more fighting games should include, but the current online problems make enjoying it difficult. Let’s hope that SNK will fix the netcode because the game’s longevity ultimately depends on it. The game is visually pleasing to the eye in more ways than those that are obvious. The style and kookiness of the presentation lends SNK Heroines: Tag Team Frenzy a unique flamboyant charm that works well enough to stand out. Cakes, ice cream, sandwiches, playing cards and other random items are used as collision effects when dealing damage. Eye candy like this is spread throughout the game to keep the action wonderfully Japanese and very fun to look at. Besides the creepy announcer’s voice, everything else is spoken in Japanese which may please or annoy players depending on their preference. It all sounds on par with the whole cutesie J-pop flavour the game’s going for and runs very smoothly at 60 frames per second whether docked or undocked. SNK Heroines: Tag Team Frenzy takes the spirit of Neo Geo Pocket’s Gal Fighter and spices it up into something very different on the current market. While it’s not clear at the moment on what corner of the market it is actually aiming for, there’s still a good chance that this game will conjure up its own following. I, for one, really hope that is the case, for the idea of blending Super Smash Bros. with The King of Fighters together sounds like something I want to see at a high level. As for playing it? I had a blast with the female fighters of the arcade era. It’s a great brawler and the whole Super Smash Bros. element works a treat. There’s definitely enough depth and wackiness to keep things interesting – at least for as long as you have others to play against.